In this Sept. 22, 2014 file photo, cans of Pabst Blue Ribbon beer sit on a shelf at a convenience store in San Francisco, California. Pabst Brewing Company and MillerCoors are heading to trial starting Monday, Nov. 12, to settle a contract dispute in which Pabst accuses the brewing giant of trying to undermine its competitor by breaking a contract to make their products. 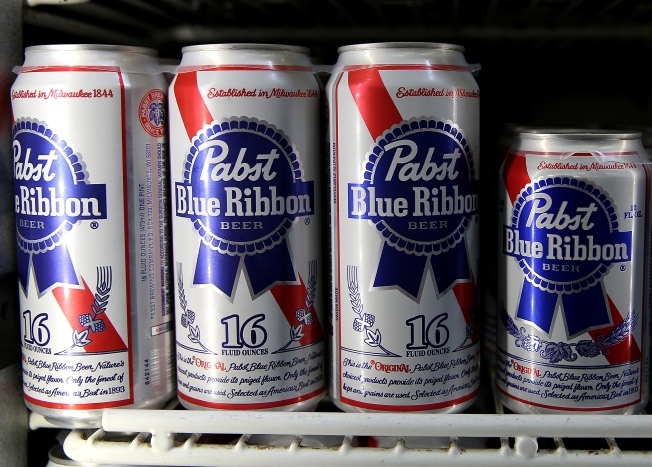 Pabst Brewing Company and MillerCoors are going to trial, with hipster favorite Pabst contending that MillerCoors wants to put it out of business by ending a longstanding partnership through which it brews Pabst's beers. The case has high stakes for Pabst, whose lawyers argue that the company's very existence relies on the partnership with Chicago-based MillerCoors, which produces, packages and ships nearly all its products, which include Pabst Blue Ribbon, Old Milwaukee, Natty Boh and Lone Star. MillerCoors, meanwhile, says it's not obligated to continue brewing for Pabst and that Pabst doesn't want to pay enough to justify doing so. The trial in Milwaukee County Circuit Court begins Monday and is scheduled through Nov. 30. Pabst's attorneys have said in court documents and hearings that MillerCoors LLC is lying about its brewing capacity to break away from Pabst and capture its share of the cheap beer market by disrupting Pabst's ability to compete. At a March hearing in which MillerCoors tried to have the lawsuit dismissed, Pabst attorney Adam Paris said "stunning documents" obtained from MillerCoors show that it went as far as hiring a consultant to "figure out ways to get rid of us." MillerCoors has called that a mischaracterization of the consultant's work. The 1999 agreement between MillerCoors and Pabst, which was founded in Milwaukee in 1844 but is now headquartered in Los Angeles, expires in 2020 but provides for two possible five-year extensions. The companies dispute how the extensions should be negotiated: MillerCoors argues that it has sole discretion to determine whether it can continue brewing for Pabst, whereas Pabst says the companies must work "in good faith" to find a solution if Pabst wants to extend the agreement but MillerCoors lacks the capacity. Pabst needs 4 million to 4.5 million barrels brewed annually and claims MillerCoors is its only option. It is seeking more than $400 million in damages and for MillerCoors to be ordered to honor its contract. During 2015 negotiations about extending the contract, MillerCoors announced it would close its brewing facility in Eden, North Carolina, and that it eventually might have to shutter another facility in Irwindale, California. Pabst contends that MillerCoors refused to provide any information to substantiate its claim that it would no longer have the capacity to continue brewing Pabst's beers, and that it wouldn't consider leasing the Eden facility and would only sell it for an "astronomical" price. Pabst says MillerCoors wouldn't agree to an extension unless Pabst paid $45 per barrel — "a commercially devastating, near-triple price increase" from what it pays now. At the March hearing, Paris said MillerCoors knew Pabst couldn't accept that proposal "because it would have bankrupted us three times over." In court filings, MillersCoors said Pabst's proposals to keep the Eden facility open "were commercially unreasonable" and that Pabst sought "a windfall through litigation" instead of offering to pay enough to keep a facility open. It also said the facility's closing was "to ensure the longer-term sustainability" of MillerCoors because thousands of new brewers have entered the market over the past decade. MillerCoors and Anheuser-Busch, which have the biggest U.S. market share at 24.8 percent and 41.6 percent, respectively, have been losing business to smaller independent brewers, imports, and wine and spirits in recent years, according to the Brewers Association. Want to carve a unique design into a pumpkin this Halloween? Watch this video to find out how. "The beer market has shifted and beer lovers are increasingly demanding more variety, fuller-flavor, and local products from small and independent producers," said Bart Watson, the Brewers Association's chief economist. Overall U.S. beer sales have declined, with shipments down from 213.1 million barrels in 2008 to 204.2 million in 2017, according to the Brewers Association. Pabst depends on MillerCoors because the only other U.S. brewer with capacity to make its products is Anheuser-Busch, which doesn't do contract brewing, Paris said. "It really is an existential issue for Pabst because it has no real alternatives," Paris said at the March hearing. Paris said the report from the consultant MillerCoors hired in 2013 proves the company never intended to act in good faith. Pabst's attorneys say the report had sections focused on how to "eliminate Pabst altogether" and noted that MillerCoors would need to close two breweries "to be sure they don't have excess capacity for contract manufacturing." MillerCoors' attorney, Eric Van Vugt, said in court that the company didn't rely on the consultant's report when it decided to close Eden or when it has contemplated closing the Irwindale brewery. "If we keep Irwindale open, yes, we can supply their beer," Van Vugt said. "No one disputes that. That's the only factor that we need to look at."